[PDF] The Art of Modeling in Science and Engineering with Mathematica (2nd Edition) | Free eBooks Download - EBOOKEE! 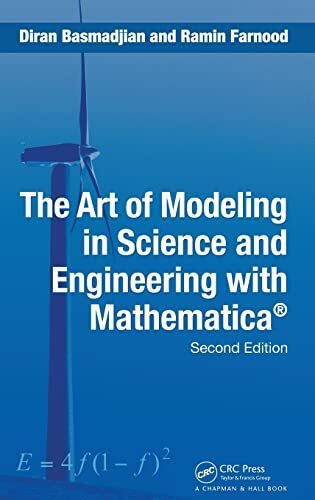 Description: Thoroughly revised and updated, The Art of Modeling in Science and Engineering with Mathematica, Second Edition explores the mathematical tools and procedures used in modeling based on the laws of conservation of mass, energy, momentum, and electrical charge. The authors have culled and consolidated the best from the first edition and expanded the range of applied examples to reach a wider audience. The text proceeds, in measured steps, from simple models of real-world problems at the algebraic and ordinary differential equations (ODE) levels to more sophisticated models requiring partial differential equations. The traditional solution methods are supplemented with Mathematica , which is used throughout the text to arrive at solutions for many of the problems presented. The text is enlivened with a host of illustrations and practice problems drawn from classical and contemporary sources. They range from Thomsonâ€™s famous experiment to determine e/m and Eulerâ€™s model for the buckling of a strut to an analysis of the propagation of emissions and the performance of wind turbines. The mathematical tools required are first explained in separate chapters and then carried along throughout the text to solve and analyze the models. Commentaries at the end of each illustration draw attention to the pitfalls to be avoided and, perhaps most important, alert the reader to unexpected results that defy conventional wisdom. These features and more make the book the perfect tool for resolving three common difficulties: the proper choice of model, the absence of precise solutions, and the need to make suitable simplifying assumptions and approximations. The book covers a wide range of physical processes and phenomena drawn from various disciplines and clearly illuminates the link between the physical system being modeled and the mathematical expression that results. No comments for "[PDF] The Art of Modeling in Science and Engineering with Mathematica (2nd Edition)".